The last few days have been full of devastating and horrific scenes of cruelty caused by one human to another. From the tragic shootings in France and the bombings in Lebanon it has been upsetting and mind numbing to even try to comprehend what goes through these peoples' minds. How can one human being take these actions against another human being? The shock and pain for all those affected is beyond understanding. In the midst of all this horror, one thing that shines through is the simple beauty and compassion within humanity. When I read an account from a brave and inspiring survivor from the Paris shootings I noticed how she focussed so much on the kindness from strangers she experienced. There were people banding together supporting one another and providing food, clothing and money for those who had been affected. It is heart warming to read. That is one thing that can never be taken away from mankind. Yes, we are flawed in so many ways. How the cowardly, disgusting people who cause this kind of pain can exist I have no clue but I do know that for every one of them there are 1000 incredible, compassionate and good people. And that is how we prevail, that is how we continue, that is how we survive. In every disaster there is one continuity, beauty in humanity. 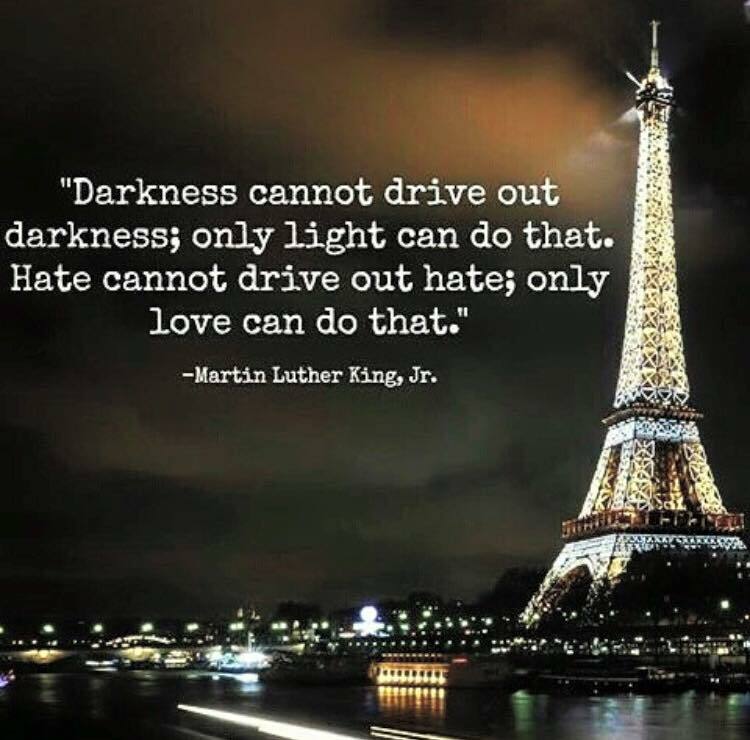 There is only one way to respond to these despicable acts and it is the very hardest thing to do, we must love. We must love one another and help each other in even just what appears to be small, it all helps. That smile to the stranger who was having a bad day, holding the door open for someone, offering your time and energy to someone who needs, it there is an endless list of ways to be kind which take very little effort to do. Remember that hate only breeds hate and love breeds love. How can we forget the profound and wise quote from Ghandi's, "an eye for an eye leaves the whole world blind". So many roads, so many choices, and it seems like I've chosen them all in this short life. Sometimes, many times, I've chosen pain - sometimes immediate, sometimes remembered, always real. I chose to let it sting me like the barbs of a nettle or an old wire fence. I chose to bleed. I chose to let the CD player of my mind run on one track all day - trying to hurt away the hurt. Many times I chose fear, chose to shrink away from the world cloaked only in thoughts of disapproval, of not being good enough. But today, I have no time for pain. I have no time for fear. Don't get me wrong. Its not because there are not things to hurt about or people who will disapprove. But because I know now, that there is ALWAYS another road. A road which I would much rather walk. So today I choose peace. I choose to not judge the world, the people in it or the things that happen to me as good or bad. But simply to know that on a far deeper level than I can ever be aware - I am safe. I am held. I am worthy. I choose to honour my body. Not only with good food, mindful eating, and exercise. But also to remember that we are sensual beings. I will comfort my eyes by finding something beautiful in each thing I see. I will caress the world with my hands, make love to it with my words, embrace it with my mind. And throughout this day, I will continue to make life affirming choices. I choose to dance, to let joy take me over completely and not worry for one moment about the ones who might see or judge. I choose to breathe. I choose to breathe life in and to let it breathe me in. I choose to laugh. Loud and long. At the world but mostly at myself for all the times I've taken life oh so seriously. And most of all - I choose love. I choose to love myself. I choose to let friend and stranger become my love. And when I walk into the world and see discord, I will look harder. I will look for beauty. I will look for peace. And I will find it. And when i meet hatred, I will open my heart so wide and let the sea of my love wash over it - till it melts away. And when I see a man, woman or child in pain (whomever they be) - I will use my life's energy to bring what healing I can. And if I cannot heal their pain, I will kneel down and wash their feet.